strap closure. Two stitched eyelets in matching color. Front panel in white, other panels and visor in color. Sporty and trendy, This 5-panel cotton baseball cap is the ideal logo medium. Available with an adjustable plastic fastener. 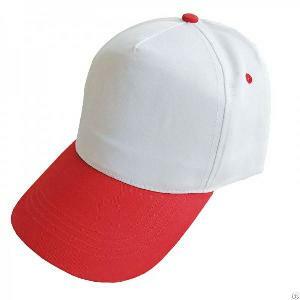 The combination of white and another color gives the cap a fresh appearance. We will place your logo on the front preferably in a matching color of the cap. Available color is optional, custom color is acceptable. Inner Lining: is optional. Better quality, Better price, Best choice for Promotion. You can make embroidery or printing on the closure band. 4 embroidery eyelets. Composition: 100% polyester twill. There are six sewing threads on the visor. Double stitching band: is able to be printed with your logo or text.